Describe how a strategy will lead to conservation success. Identify and articulate a team's assumptions about how strategies will change key drivers, leading to improvement in conservation challenges and linked human well-being challenges. 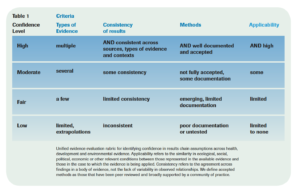 Evaluate the strength of evidence for a strategy's assumptions. Evaluate which strategies to make strategy maps for. A results chain is a diagram that depicts the assumed causal linkages between your actions and their desired impacts through a series of intermediate results. It is a graphic depiction of the way you expect your strategy to unfold. In developing and refining your results chain or chains, you will iteratively test and tighten your reasoning. Your completed results chain and its narrative will be important tools for conveying your strategy, and the thinking behind it, to important stakeholders including donors, partners, decision-makers and stakeholders. 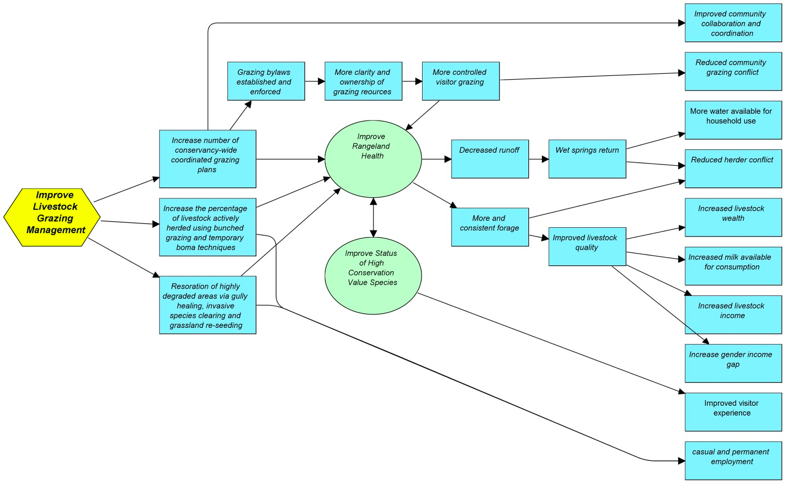 Construct an initial results chain for each strategy based on your conceptual model or situation analysis diagram. A results chain is a diagram that depicts the assumed causal linkage between an intervention and desired impacts through a series of expected intermediate results (Foundations of Success 2009, Margulis et al. 2013). We recommend starting results chains (on the left) with a statement of the undesirable state you wish to alter, and ending them (on the right) with a statement of the desirable state you wish to achieve. The description of the undesirable state can be a statement of a key challenge identified in previous steps. The results chain should set you up to assess whether a given strategy will likely achieve the minimum goal, so elements on the right leading to the desired state should reflect elements of your minimum goal statement. Including language defining the undesirable and desirable states also helps ensure results chains represent causal logic from conservation action all the way to outcome, rather than stopping short at implementation of actions or intermediate outcomes. The example shown here demonstrates how the links in a situation analysis can be modified and expanded upon to show the change expected by the implementation of a strategy. Here is an example of how you can convert a situation analysis into a results chain. First identify the relevant components of the full situation analysis associated with a key challenge. This is shown in Figure 6 where the relevant components of the wind energy situation analysis are shown in color and the remainder is grayed out. This helps focus on expected changes from implementing a strategy while clarifying additional drivers that may influence effectiveness of the strategy, or non-target changes that may present opportunities or risks. Then identify how the conservation strategy (action) will affect conservation and human well-being elements. 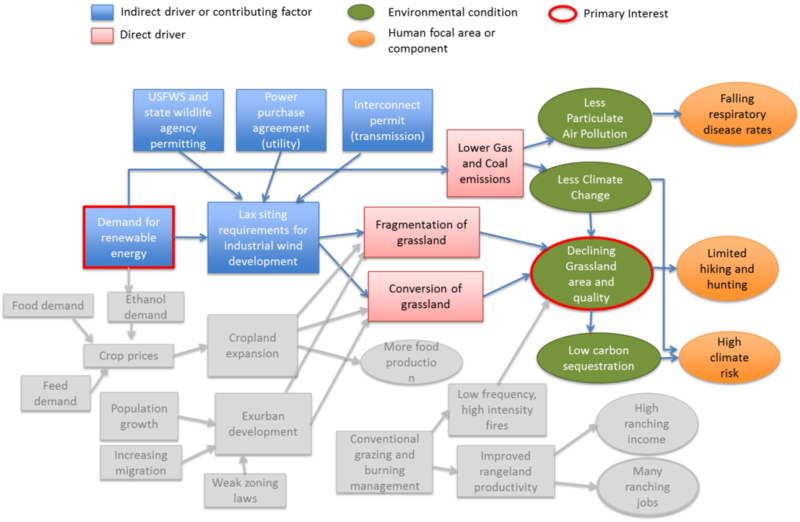 This is shown in Figure 7 where red text emphasizes expected changes in the system that may result from the conservation strategy. Each link reflected in the results chain should articulate a testable hypothesis about cause and effect. Results chains should depict changes in primary interests (in this case, grassland extent, connectivity and quality) as well as other expected changes (in italics; e.g. increased recreational opportunities, decreased respiratory disease). Consider replication as a part of the strategy. If there is an expectation that others will replicate or otherwise leverage your work, then this should explicitly be included in the results chain. Focus on achievement of results/impact rather than execution of activities (i.e. a results chain vs. an implementation plan). Working towards a desirable state as the endpoint of a results chain will help with this. Use consistent symbology for elements of situation analysis diagrams and results chains. Figures 6 and 7 show one commonly used symbology consistent with Miradi and the Open Standards. This guide covers how to use results chains to test your assumptions of how your strategies are intended to change the situation. Foundations of Success. (2014). Step 2A Develop a Formal Action Plan: Results Chains. Foundations of Success. Bethesda Maryland, USA. There are tools specifically designed to construct results chains. Miradi Adaptive Management software or Cmap can assist with results chain construction including converting situation analysis diagrams to results chains. Direct impacts on human well-being result from social changes caused directly by the conservation strategy (solid line in Figure 8). For example, if a protected area hires park guards, this has the direct effect of increasing jobs. No environmental change is required to create the jobs. Nature-mediated impacts result from a loss or gain in human well-being as a result of changes in the environment caused by a conservation program (dotted line in Figure 8). For example, improvement in household income from higher fish landings outside of a marine protected area is a nature-mediated impact, because the conservation strategy first has to impact the environment before the social change occurs. Conservation practitioners may be least familiar with the plausible direct impacts of strategies on human well-being, so additional attention should be given to ensuring their consideration. Consultation with external experts may be helpful. The Conservation Measures Partnership produced this well-regarded guidance to help your team address human well being in your results chain. Ensure that all connections and intermediate results from doing a strategy are directly captured in the results chain. Some strategies are done explicitly to build trust, establish your 'social license' to operate, gain access to a key stakeholder, or to achieve similar preliminary results that must occur before other strategies can move forward towards conservation outcomes. Since they lead to important intermediate results, they should be explicitly included in the results chain. Results chains from several strategies can be linked to show the interconnections and timing of strategies. Results chains should capture both focal and additional outcomes from a proposed strategy. Most conservation strategies will cause many changes to a socio-ecological system, including those the strategy aims to change (focal) and many others (additional). Additional outcomes may be other environmental changes or social or economic changes, and they may be either positive or negative. Full consideration of these additional changes should be made, and their potential reflected in the results chain. Additional changes represent opportunities and risks. When they reveal opportunities, managers can decide to elevate specific outcome statements associated with them, or identify them as plausible co-benefits. When risks are revealed, see the next point. The Bridge Collaborative Practitioners Guide provides guidance and examples for refining results chains to capture additional outcomes. Any risks to vulnerable people identified through a results chain should be addressed. Many potential risks can be eliminated or reduced by adding or altering a strategy element. For example, you may be considering 'hiring park guards' to increase protection of an existing national park that houses endangered species. Through creation of a results chain, the team realizes that hiring guards from only one local community presents the risk of creating inequality and conflict among communities. You could avoid this problem by changing the strategy to 'hiring park guards with equal representation from local communities', which mitigates the risk of creating inequality. In cases where risks to vulnerable people cannot be mitigated, the strategy should not be pursued. When a risk emerges that is potential, but acceptable to stakeholders, it should become the focus of intensive monitoring and adaptive management. In cases where risks to vulnerable people cannot be mitigated, the strategy should not be pursued. Results chains should be composed of assumptions that can be tested. Clearly state assumptions so that the strength of evidence for each of the assumptions and linkages between assumed intermediate outcomes in your results chains can be assessed. For example, ask "What has to be true in order for the proposed relationship between node A and node B to exist?" In the wind energy example, the first link assumes that if utilities require avoidance in sensitive areas, then they will only buy power from companies that have avoided sensitive areas. Complete the links in the results chain. Identify any additional intermediate steps that are necessary precursors to achieving outcomes. In contrast to conservation and human well-being outcomes, intermediate results tend to be nearer-term and are preconditions for achieving an outcome (e.g., building a consortium to support a policy change; proving that a new sustainable finance mechanism functions as intended; developing a plan for major additions to a national park system). Explicitly including intermediate results is important because they are used for: identifying indicators for monitoring, defining go/no-go decision-points, discerning risks, enabling early detection of necessary strategy changes, and articulating important early results for donors. The first results chain here (Figure 9) for the Northern Rangelands Trust includes terms like 'increase economic benefit' and 'increase social benefit' to initially describe human well-being outcomes. To improve upon this, the results chain was expanded to clarify the links between strategies and human well-being components. Figure 10 is a sample of one of the expanded results chains, focusing on the livestock grazing management strategy. This example emphasizes why specification of outcomes, including unintended (or additional) outcomes is critical. Income improvement is a primary interest of local communities engaged in the grazing programs. Detailing of the results chain showed that improved rangeland productivity is expected to improve livestock quality, but discussion with local stakeholders revealed that rangeland benefits may only accrue to cattle, not sheep and goats because of grazing practices. In many of these communities, men herd and sell cattle and women care for and sell sheep, goats and their products. As income is not openly shared in some households, improving forage for cattle, but not sheep and goats could create greater income inequality among genders--a negative unintended outcome for a vulnerable group. Another strategy not shown here aims to increase livelihood and income options for women, and may offset this potential risk. Because this is a risk to a vulnerable group, it is being monitored closely. Look for gaps in logic. Look for “leaps of faith” or “then a miracle occurs” gaps in logic. These are places where there may be intermediate steps or additional assumptions that have not yet been articulated, or where the language in the nodes needs to be more specific. For example, imagine the wind energy example showed ‘fewer permitting problems speeds wind development’ directly linked to ‘much less particulate air pollution’. Is the logic clear for why fast wind development will reduce air pollution? No, because the link to emissions, which are the source of the air pollution problem, has not been made. Specifying the connection removes the ‘leap of faith’ element and makes clear the expected set of changes. Assess the sufficiency of intermediate results. When considering intermediate results for inclusion, ask whether each is absolutely necessary and if together they are sufficient to achieve desired outcomes. Work ‘forwards’ and ‘backwards’ to identify steps. Articulate logic by starting with strategies and working through if/then linkages to desired outcomes, and working backwards from outcomes to a strategy, asking what other results (i.e., intermediate results) must be achieved along the way in order reach a particular outcome. Evaluate whether there is evidence for a strategy’s assumptions. Is there a quantitative or qualitative assessment that measures the specific assumption in the link? If yes, then there is evidence for this link. If no, there is not evidence for this link. The purpose of this step is to identify whether evidence exists for the actual assumption, not its potential. Evidence can come from quantitative meta-analysis, key informant interviews, traditional knowledge, or many other sources here as in other uses of evidence, but it must be used to assess the specific assumptions. For example, continue the wind results chain, and consider the first assumption that utility requirements for companies to avoid sensitive grassland areas lead to utilities purchasing power only from those companies that do so. Evidence for this assumption may come from utility power purchase records (quantitative), or from interviews with managers from wind power producers (may be quantitative or qualitative). If in manager interviews, managers say they think utilities will purchase more wind power from them in the future after they change practices because they have a good relationship with the utilities, this does not constitute evidence. If, however, managers say they have had higher sales to the utilities after improving siting practices, that qualitative information constitutes evidence for the assumption because it reflects a direct observation that the assumption is true. Often, results chains are worded ambiguously. 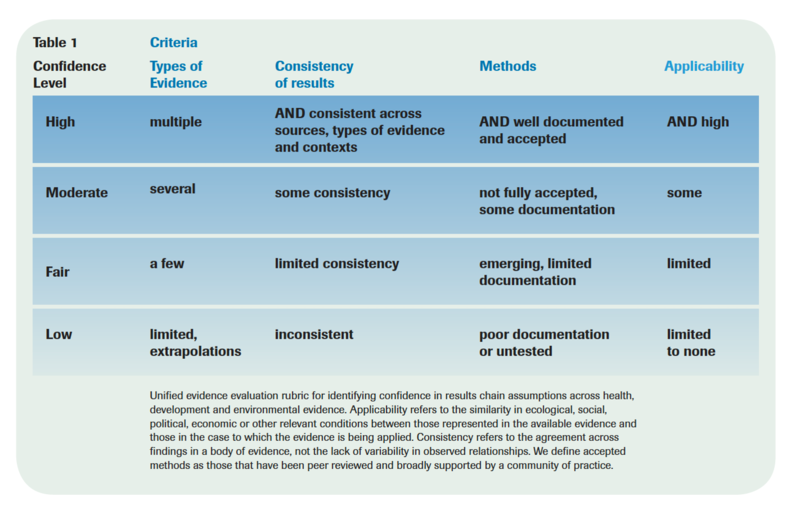 Thus, a first step in assessing the evidence for a results chain is to be re-word the results chain so that it is clear what evidence is required. The revised results chain below is more specific. Note that even a specific results chain will require definition of terms. In this example, it must be clear to readers what is meant by 'early season burning', 'vegetation communities of conservation concern' and 'native fauna'. Evidence searching will be easiest when results chains are highly specified. Fully consider potential sources of evidence. These may include peer reviewed literature, grey literature, the experience of practitioners, and traditional knowledge. The Bridge Collaborative Practitioners Guide provides case studies and tools for evaluating evidence and for representing its strength both graphically and in narrative form. Evidence must meet minimum standards to be considered evidence. To be considered evidence, the assumption/hypothesized relationship that you are seeking evidence for must have been measured or observed. Opinions that something should work, even when contained in a peer reviewed paper, do not count. For example, if sustainability standards are expected to change corporate behavior, then examples where sustainability standards were followed by widespread adoption across the industry would be required to constitute evidence. All knowledge sources have the potential to hold evidence for our assumptions – not just peer reviewed literature. The practitioner's job is to discern whether a quantitative or qualitative assessment from any source deals with an observation of the assumption being true or false (evidence) or states its potential (not evidence). Evidence is strong when we have confidence that additional data will not reverse our conclusions. This is generally the case where there are consistent findings across multiple studies or where the magnitude of effects are very large. Studies where rigorous experimental designs are used (including before-comparisons as well as an appropriate control group) also generate confidence. Although there is not yet consensus among conservation practitioners around a particular formula for evidence grading at this time, expert judgment should consider these factors when assessing strength of evidence. Imagine a grazing strategy that aims to improve rangeland productivity and wildlife populations by incentivizing planned grazing with access to markets. An assumption in the results chain is that if livestock managers follow grazing plans, they will receive better market access. A search of the literature shows no studies of whether grazing compliance in similar programs leads to improved market access, so the team quickly conducts some key informant interviews with livestock managers in an existing, similar program. Some managers report receiving better market access after implementing grazing plans, and some report not receiving better access. You have evidence for this link – multiple people have observed whether or not the assumption is true. But, the evidence is weak because some supports the assumption while some refutes it. When we find evidence supporting a causal relationship, we have learned that 'it worked somewhere.' However, this does not necessarily mean that it will work in your planning context. Explicitly consider and document what enabling conditions are necessary for a causal relationship to hold. For example, community enforcement of marine protected areas may reduce illegal fishing only if financial support for boat fuel is provided. It will often be the case that there is no direct evidence as to what are the enabling conditions. However, it is still essential to make an assessment of enabling conditions, as absence of enabling conditions is a major reason that projects fail. Ask yourself 'why' a causal relationship holds. Explicitly articulating this hypothesized mechanism can help you identify the conditions under which this mechanism holds. Determine the sufficiency of the evidence. The sufficiency of evidence for a strategy depends on the level of risk that the organization/funders are willing to accept. For example, some uncertainty about a causal relationship may be acceptable to managers, because the cost of being wrong is perceived to be low. In contrast, uncertainty about other causal links may be unacceptable because a high degree of confidence is needed in order to manage reputational, legal, or financial risk, or risk to vulnerable people, or to persuade key stakeholders to change their policy or practice. Evaluating sufficiency requires both an understanding of the evidence and of your organization's appetite for risk in the specific context of your strategy. If evidence is determined to be “insufficient” it can point to priorities for research or monitoring. A weak link in the results chain does not necessarily mean the strategy should not be advanced. Rather, it may illuminate where additional research or monitoring focus is needed. In many cases, such monitoring to build the evidence base will be essential to gain support for full implementation of a strategy and thus will be a key component of the strategy that should explicitly be included in the results chain. Verify that your results chain meets criteria of a good results chain. Starts with a key challenge and ends in a desirable state. Articulates specific intended outcomes for conservation targets and human well-being interests. Captures major additional outcomes (benefits and risks). Contains links that are based on clear causal connections. Is clear about what is changing compared to current conditions as a result of the conservation action. Contains sufficient intermediate results to construct logical connections toward the desired outcome, such that someone not familiar with the project could follow the logic. You can use software such as Miradi, Visio, Compendium, or Cmap to help you capture your results chains digitally. Write a narrative summary of each results chain. Describe the chain in a few paragraphs, summarizing the logic of your assumptions. This text will help others who did not participate in the discussion to understand your results chain, and it will also serve the purpose of formally documenting group discussions and decisions. Consider alternative formats, tailored to your audience. Depending on your audience, simplified results chains or other drawings that illustrate cause and effect should be considered. For some audiences, depicting strength of evidence graphically (e.g., using color coded arrows that indicate sufficiency of the evidence supporting the assumptions implicit in the arrow) will be a desirable product (e.g., to help accentuate to managers the overall risk associated with a given strategy and to identify the links within a strategy that most warrant monitoring investment.) 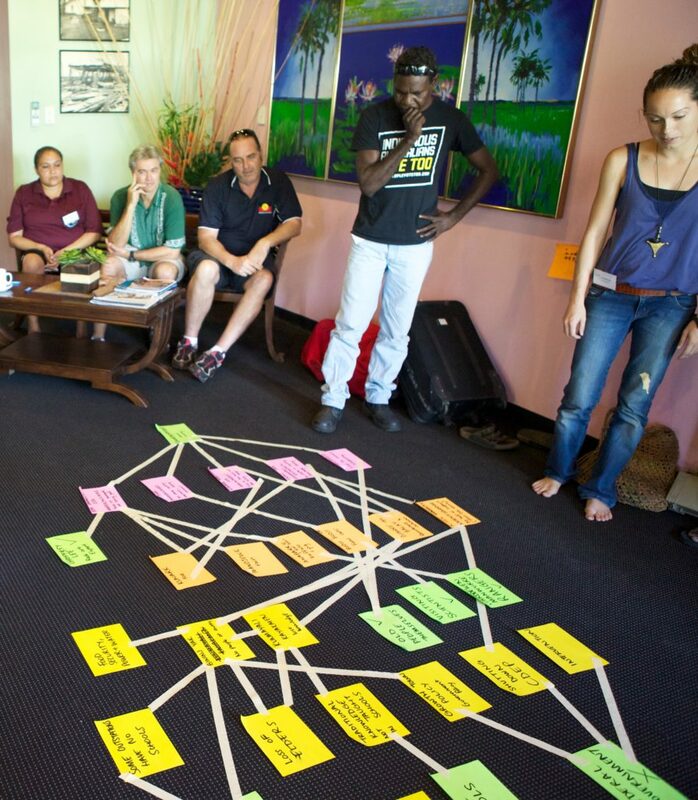 For instance, many Conservancy staff and partners who work with Indigenous Peoples have devised alternative approaches such as Life Planning (in the Amazon), Participatory Mapping (in Melanesia), and Healthy Country Planning (in Australia), using maps and stories instead of results chains. Create a bibliography and summary of assessed evidence. Your bibliography and summary of assessed evidence should include documentation of local knowledge or expert opinion. Seek peer review of the results chain. Peer review can help ensure that the subsequent efforts in mapping strategies are based on robust understanding of the cause and effect relationships that we assume can lead to the desired outcome. Peer review also improves your ability to articulate your assumptions and logic behind the strategy. Do your results chains start with a key challenge and end with a desirable state? Are your intermediate results necessary and sufficient to achieve your desired outcomes? Does your results chain show the intended positive outcomes for conservation and any intended, linked positive outcomes for human well-being from the proposed conservation action? Did you explicitly consider additional (unintentional) outcomes, including both positive and negative outcomes from the strategies considered? Do all links in your chains reflect no more than one testable assumption (i.e. there are not “leaps of faith” or “then a miracle happens” gaps in logic)? Have you evaluated and recorded the strength of evidence for each of your assumptions and linkages? If your results chain outcomes are quantified, will they be sufficient to determine whether the strategy meets the minimum goal(s)?